One of our most successful programs to date. The Green Iowa AmeriCorps first step home energy assessment program has helped over 1000 homes in northeast Iowa become more energy efficient, saving the average homeowner over $120 on utility bills annually! The program serves households in Howard, Winneshiek, Allamakee, Fayette, Clayton, and Chickasaw counties. If you are age 65+, disabled, a veteran, or a low-moderate income home (see table below), you likely qualify for a FREE service. Call our office to find out: (563) 382-4207 ext 2. Comparable utility programs across the country value this service at $200-$500. Thanks to Green Iowa AmeriCorps and the regional collaborative, costs are kept low and impact is high. The average home sees annual energy savings of over $100, making the typical payback period for non-qualifying homes just 6-12 months! 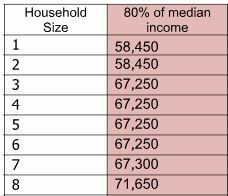 Single Family homes that meet the following income criteria (80% median income) and are located in Howard, Winneshiek, Allamakee, Fayette, and Clayton Counties are paid for by the Regional Housing Trust Fund. Safety first! We test for carbon monoxide and gas leaks at every home to ensure a safe and healthy home environment. The blower door test measures the level of air infiltration in your home: thermal imagining help identify air leakage locations and areas that could use more insulation. High efficiency (LED) light bulbs that use 20-70% less energy than non-LED bulbs. Faucets with high-efficiency aerators that help you save water without a change in water pressure. Insulation of hot water pipes will save energy used by your water heater. Duct sealing will increase the efficiency of your heating and cooling system. *The average customer saves $120 per year on their energy bill, thanks to direct installs. Air sealing is only available for single-family homes, either owner-occupied or with permission of a landlord, AND where blower door test indicates a need and opportunity. Air sealing steps may include: install door sweeps, caulk leaky windows and door frames, target spray foam, weatherstripping, window kits, and more. After sealing, we repeat the blower door test to analyze improvement. Impacts and savings can vary widely. We document the impacts in our report to you and provide recommendations adn references if further work by a contractor or agency would be valuable. Comfort – Reducing drafts help maintain consistent indoor temperatures. Savings – You can save $50 to over $500 annually with improvements that last for many years. The average home sees $120 annual savings. Conservation – Conserving energy reduces harmful power plant emissions, protecting human health and preventing climate change. 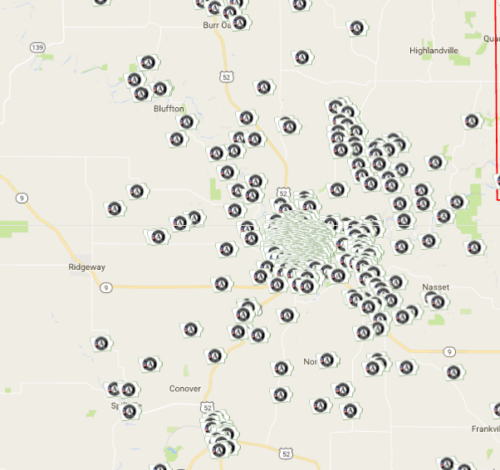 The Regional Housing Trust Fund sponsors FREE Green Iowa Home Energy Assessments for low-moderate income, single-family homes in Allamakee, Clayton, Howard, and Winneshiek counties in northeast Iowa. Sign up for our program when you sign up for low-income heating assistance (LIHEAP) or home weatherization at any NEIA Community Action office.